A legal process demanding Socio-Economic Justice based on Truth and Reconciliation as commenced in 1994. A pro-active defence is a legal right and a matter of fundamental public importance to Namibia and the Western World. In the early 1960s, the late John F. Kennedy described the modi operandi of a monolithic and ruthless conspiracy that has captured the Western World, manipulated it, the United Nation (UN), the UN Security Council, the EU, the UK, the United States and the International Criminal Court (ICC) from exercising their independent legal obligation to dispense social and economic justice in Namibia, prior to its political transition to independence in 1989, during that period and thereafter, as my defence as witness and a victim demonstrates. From respective authorities, this socio-economic justice forum demands an investigation into and the prosecution of those who perpetrated crimes committed against humanity in 1989 in Namibia. Crimes against humanity are termed Social Justice Cases, but simultaneously, this forum demands an investigation into and the prosecution of perpetrators of significant economic crimes (Economic Justice Cases), the latter amounting to billions of dollars in damages the country/government has suffered as has been catalogued between 1971 to and 2006. This forum seeks to deliver social and economic justice in Namibia in what, by design, currently is a politically fragmenting society. 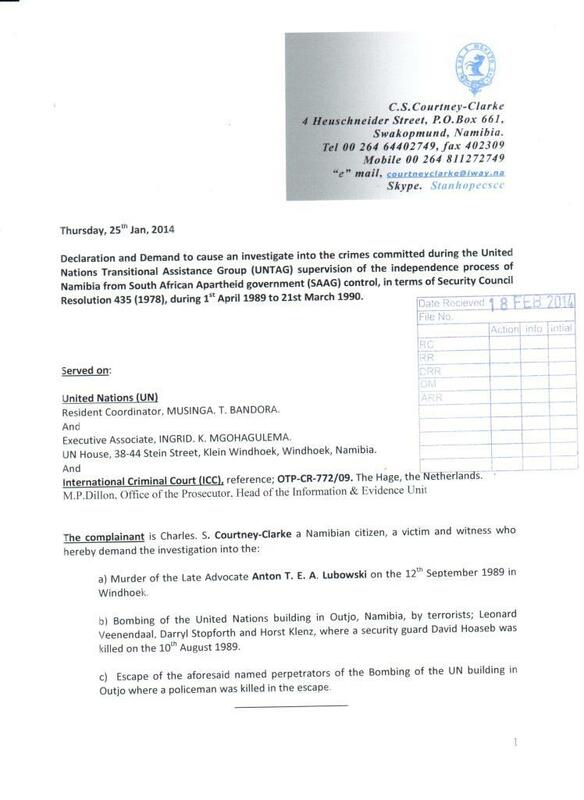 The 1st Declaration and Demand to the United Nations to investigate the crimes of 1989, submitted at Windhoek in January 2014, resulted in the removal of UN Resident Coordinator MUSINGA T. BANDORA and the UN Executive Associate, INGRID K. MGOHAGULEMA, to whom the Declaration and Demand was delivered. The officials replacing them found all the information on the computers at the Windhoek office removed when they arrived, and therefore no evidence of the Declaration and Demand to investigate the crimes of 1989 committed during the Namibian transition to independence as supervised by the UN was to be found. 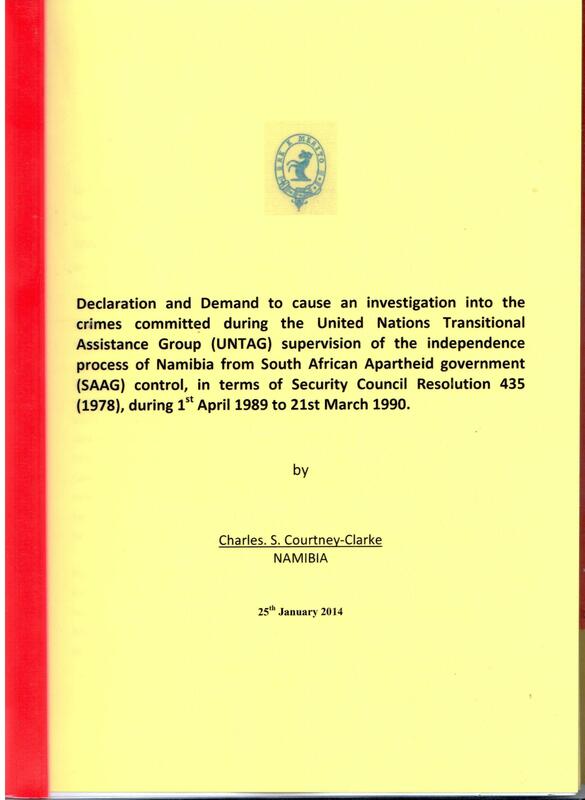 A re-submission of the Declaration and Demand to investigate the unsolved crimes committed against humanity and the United Nations in Namibia during its transition to independence from 1989 to 1990 contains the crimes as listed below. 1) The bombing of the UN office in Outjo, Namibia. 2) The capture and escape of the perpetrators of the bombing. 3) The murder of Advocate Anton Lubowski. In the first instance, the appeal in the Declaration and Demand to the UN petitioned it to determine the existence and integrity of the police dockets of these crimes. These police dockets are in the custody of the local Namibian police responsible for investigating the crimes and whom the United Nations have relied on as a first legal remedy in the prescribed procedures to resolve the crimes committed against itself and humanity. Formal complaints to investigate these crimes were submitted to the authorities as listed below. 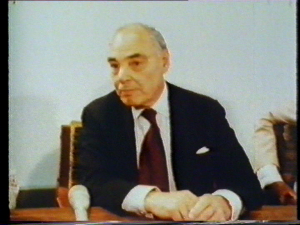 In all respects they have defeated the ends of justice in one form or another as described in the first and only investigation into the murder of Anton Lubowski by Justice A.J. Mohamed in 1990: “[…] the image of justice in Namibia. That image and that interest might prejudicially be impaired if there ever follows a perception in the public (legitimate or otherwise), that justice was defeated by procedural complexities, by legal stratagems, by tactical manoeuvres or by any improper collusion” . The Namibian Government and Police. 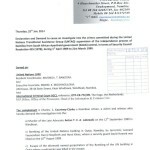 Anti-Corruption Commission Namibia, complaint file C.S. Courtney-Clarke, ACC HQO 13-000610. 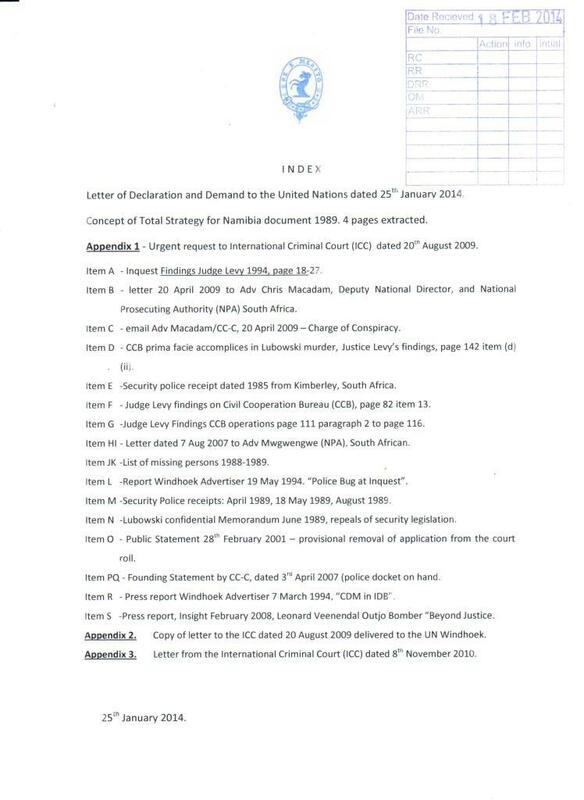 South Africa – Directorate of Special Operations (DSO)/Scorpions) and Priority Crimes Litigation Unit. British High Commission. Windhoek, Namibia, 2002. 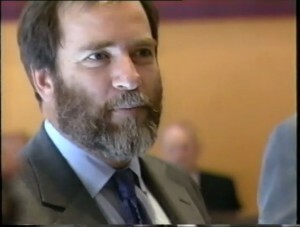 Truth and Reconciliation Commission, South Africa, 2007, complainant Gaby Lubowski. International Criminal Court, file number OTP-CR-772/09. 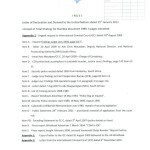 United Nations, Windhoek, Declaration and Demand, 2014. These crimes committed in Namibia by the White South African Apartheid Government (SAAG) were perpetrated within a greater premeditated economic colonization plan, designed and directed by the “Key Financial Beneficiary”(KFB) to expand its existing ownership and control of the wealth of the country. 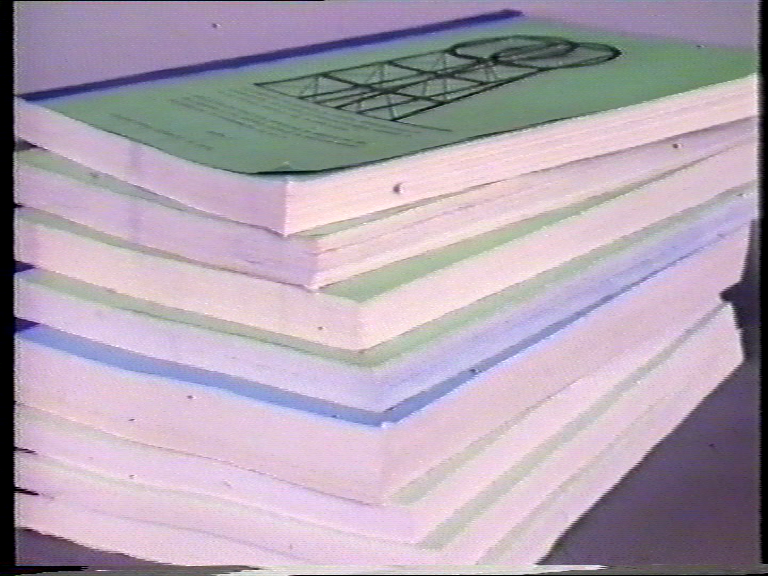 This premeditated economic plan was primarily devised to counter the nationalization of industrial assets and mineral rights by governments , a manouvre that was initiated in 1950. The economic colonization plan commenced with the announcement of the argument that in all respects, private industry does provide better services than governments. Following these widely published economic scenario planning pronouncements in the mid-1970s, the concept of rivatization mechanisms (i.e. privatization, commercialization, marketization and globalization of the package), were devised and strategically linked to a dysfunctional National Development Plan (NDP) of Small and Medium Enterprise (SME) activities that was imposed upon governments and emerged in harmony across borders from the United Kingdom to South Africa and Namibia. The scheme is engineered for the sole purpose of perpetuating the KFB’s economic colonization of the country’s wealth. The long-term goal of creating a Corporate Feudal System (CFS – i.e. a New World Order) which aspires to bankrupt governments through privatisation/commercialization of strategic industrial assets and services of governments in the process, regardless of the social consequences of their actions. The “Key Financial Beneficiary” of the wealth of Namibia is the Oppenheimer Family (E. Oppenheimer & Sons). Funded by the Rothschild’s J P Morgan bankers during the gold rush in South Africa in 1888, the Oppenheimers have evolved to be decisive owners and controllers of the initially Rothschild-funded corporations De Beers, Anglo American, and Barclays Bank – on the back of Namibian diamonds! The Oppenheimer Family in turn control/own hundreds of subsidiary corporate conglomerate companies and financial institutions through interlocking shareholdings. The precise manner in which it asserts its control is best described by Corporate Investigators Kroll and Associates in London. 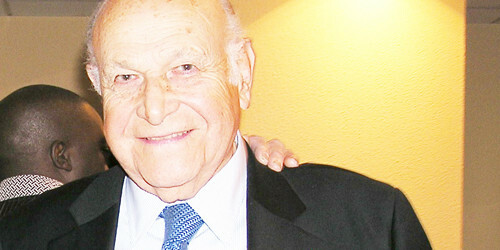 HARRY OPPENHEIMER, 80 years of age, who dominated the South African economy for nearly half of the past century. South Africa’s mandate to administer Namibia in 1966 was terminated by an International Court of Justice ruling of 1971. It declared the South African Apartheid Government’s occupation of Namibia illegal. It also declared the exploitation of Namibia’s natural resources by foreign multi-national corporations to be illegal. This led to a predictable decline in “White” political control in Namibia and South Africa, and fear of a future “unpredictable” Black government reared its head. Upon these rulings, the Nationalist Party did an about-turn on its threat to nationalize KFB’s mining assets in the mid-1960s. The escalation of nationalization of multi-national corporations’ industrial assets and natural resource exploitation rights by governments’, at that time posed the biggest threat to the KFB and its associates in the Western World. 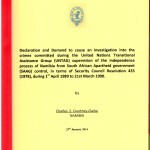 The SAAG then established an interim government in Namibia in 1980, contrary to international law, and simultaneous it set up a secret parallel government management structure (namely STRATCOM, a “third force”) through which it effected and managed the greater economic colonization/privatisation of Namibian assets in their hands. The new, interim Namibian government was structured during the 1980s to accommodate easy access to manipulate the government companies that owned the government’s strategic industrial assets. The sole purpose of arranging these assets into independent legal entities facilitated easy access to them by the KFB after the country achieves independence from apartheid rule. Namibia obtained independence in 1989/90, supervised by the UN in terms of UN Security Council Resolution 435, 1978. SAAG’s “Hit Squads” such as the CCB/BSB executed people who opposed the economic colonization scheme and are among the crimes mentioned that I demand to be investigated in the public interest. This was an early observation by Judge Mohamed of activities by officials to defeat the ends of justice during the judicial proceedings into the first and only investigation of the Lubowski murder. This extends far beyond the murder of Lubowski as the documents presented show. STRATCOM’s Military Chief Magnus Malan under cross examination can be viewed in the video clip below. This is merely one item of a catalogue of cogent evidence of how justice was and is being defeated by tactical manoeuvres and improper collusion. As a result of the failure of the respective authorities to act and dispense justice in Namibia, this website will serve to communicate the ongoing legal demands to South Africa, inclusive of Her Majesty’s government in the United Kingdom and the United Nations,and serves as a private judicial forum to implicated international institutions and governments to ensure that social and economic justice are dispensed in Namibia. The case of the Disappearing Diamonds,1980-1994. 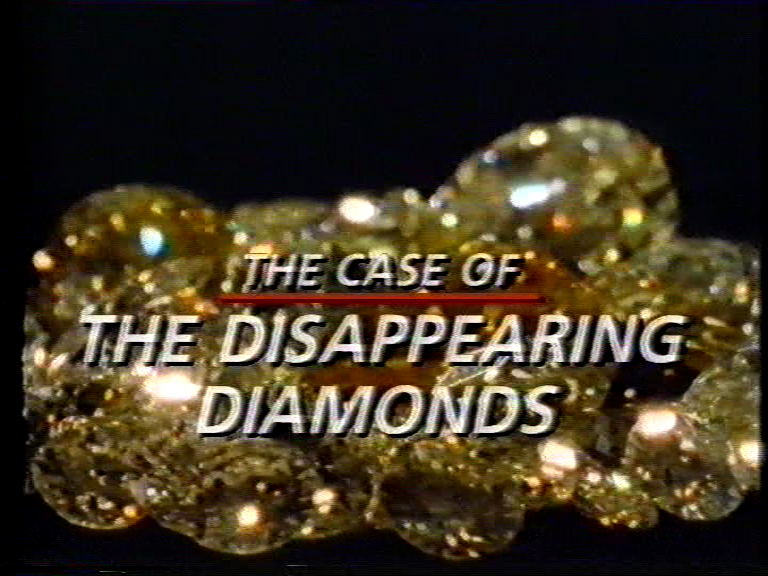 The case of the Disappearing Diamonds, 1980-1994. The evidence presented commences with Chief Justice P. W Thirion’s findings in the final report of the commission of Inquiry dated 1985. The object of the Commission was to inquire “into alleged irregularities and misapplication of property in representative authorities and the central authority of South West Africa/Namibia”. BBC- Granada “World in Action” covered the Thirion Commission’s findings in a documentary film produced in 1987, titled “The Case of The Disappearing Diamonds” . The Thirion Commission’s findings and the films produced at that time present evidence of the clandestine manner in which the Oppenheimer Family had manipulated the Namibian government the year after it was established by the SAAG in 1980. The Oppenheimers ensured that the new interim government could not verify the quantity of diamonds it was mining and transporting by helicopter to Kimberly in South Africa. In this way – and contrary to international law – a catalogue of cogent evidence shows the manner in which the Oppenheimers amassed an illegally fortune at Namibia’s expense. The documentary film “The Case of The Disappearing Diamonds” inspired the making of a comprehensive feature film on the Oppenheimer’s in 1994, titled “The Diamond Empire”, in which the Oppenheimer Family refused to participate. As the “Key Financial Beneficiary” of the wealth of Namibia, the Oppenheimers’ control over Namibia’s primary resources and financial institutions came about as a result of their pursuit of the premeditated plan to “colonize” Namibia’s economy. They could only succeed in this through a government they had manipulated, i.e. “captured”, on two fronts. 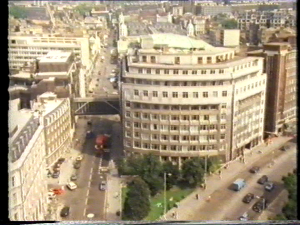 This capture commenced in 1971 and was consolidated in 1990. This is the focal point of how to understand the magnitude of the Oppenheimer’s’ wealth and the cause of our country’s increasing national financial despair and social discontent. The persisting theft of Namibia’s mineral and marine resources is a result of the Oppenheimer’s deeply entrenched network of control over strategic government tasks, particularly in the fields of the judiciary, in state prosecution, and in the police force. It was/is meticulously choreographed to control the Namibian state’s affairs and thus to escape justice. Seven cases during 1992 and 1993, some of them before court, are presented to show the collusion between the Oppenheimers’ and the SAAG’s STRATCOM officials defeating the ends of justice in Namibia, with the Oppenheimers fuelling the war in Angola at US$ 14m/week. 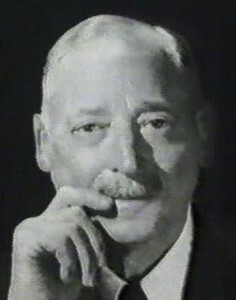 In 1987, the late UN Commissioner to Namibia, Bernt Carlsson, expressed his view on De Beers, Anglo American and their illegal exploitation of Namibia’s diamond and mineral resources. 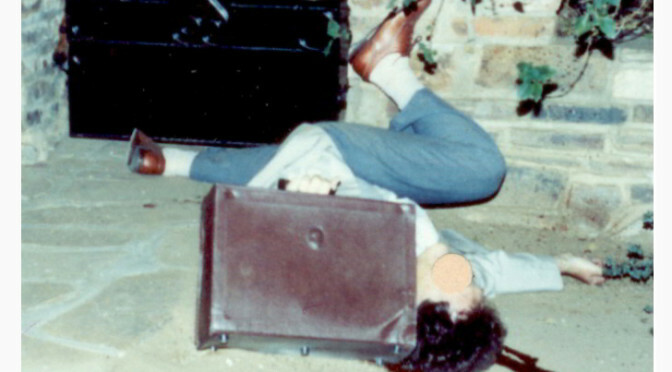 It clearly supported the findings of Justice Thirion’s Report of 1985. The record on which this statement was made luckily is intact. The head quarters of the loot robbed from central southern Africa. US$14m/per week of illegal diamonds purchased by De Beers that was fuelling the war in the country in 1992. Maurice Tempelsmann, New York, Lazara Kaplan. …..As a result of the failure of the respective authorities to act and dispense justice in Namibia, South Africa and Her Majesty’s Government in the United Kingdom, this website will serve to communicate the on-going demands to International Institutions and governments to dispense Social and Economic Justice. The quest for social and economic justice should start right at the beginning with the African bantu Expansion in 1300 AD. The aboriginal khoe-San of Namibia (Basters, Coloureds, naman and San) have been wronged by many nations of the world, conglomerates, gangs, rich families and influential individuals. The trend is unchanged today. All perpetrators must be held accountable: Africans, Europeans, Asians, Middle Eastern countries, Latin Americans and Namibians. The aboriginal khoe-san of Namibia eat soil while thieves and liars live like kings. Where is the justice in that? Swapo must return our ancestral land and property. They must answer for their crimes against the aboriginal peoples of Namibia, Namibians and humanity. State Capture in Transition Economies is a form of grand corruption and is defined as the efforts of firms to shape the laws, policies, and regulations of the state to their own advantage by providing illicit private gains to public officials. In transition economies, corruption has taken on a new image - that of so-called oligarchs manipulating policy formation and even shaping the emerging rules of the game to their own, very substantial advantage. We refer to this behaviour as State Capture. In particular, we emphasize the importance of mechanisms through which firms seek to shape decisions taken by the state to gain specific advantages, often through the imposition of anti-competitive barriers that generate highly concentrated gains to selected powerful firms at a significant social cost. The captured economy is trapped in a vicious circle in which the policy and institutional reforms necessary to improve governance are undermined by collusion between powerful firms and state officials who reap substantial private gains from the continuation of weak governance. Joel Hellman and Daniel Kaufmann, Finance & Development, IMF quarterly magazine – September 2001, Volume 38, no 3. Improper Collusion to defeat the ends of justice in the Lubowski case.